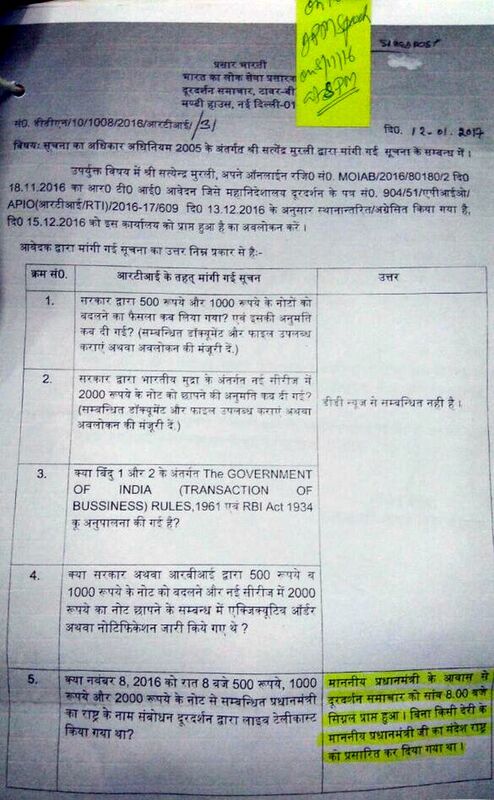 For the last two years Right to Information activist R L Kain has been trying to get details about demonetisation -- how it was done, who took the key decisions and whether Prime Minister Narendra D Modi called a Cabinet meeting before his speech at 8 pm on November 8, 2016, to announce the move. The prime minister's office has refused to divulge details pertaining to the printing of currency notes post the note ban, citing the exemption clauses related to national and economic security in the RTI Act. "Demonetisation was a dirty game played on the common man," Kain tells Rediff.com's Syed Firdaus Ashraf. What information were you seeking through your RTI plea on demonetisation? I wanted a copy of the (minutes of the) decision when demonetisation took place, but I was refused that. I said if you are not giving me the copy, then at least show me those minutes, but I was told that if the government does that, then the Indian economy will be in danger. I am only asking when the new currency notes were printed and on whose orders they were printed. I got partial information from the Reserve Bank of India, that these new currency notes were published on May 19, 2016, and sent to the central government. Now the central government is not telling me who ordered the printing of new notes. The finance ministry is not answering this question, the PMO is not answering. Whereas I have got the information from the RBI that by September 2016 the new currency notes were printed and ready. (Please click here to see the RBI's reply: Page 1 and Page 2)). This was when Urjit Patel was deputy governor of the RBI. It means this entire exercise was illegal. I am asking for this information and they are not giving. Why do you call it illegal? Raghuram Rajan quit (as RBI governor) in September (2016) and Urjit Patel was deputy governor till then. It is an offence if the deputy governor signs currency notes when the RBI governor is still working. So, when Rajan was governor of the RBI, how could Patel have signed the new currency notes? Moreover, Prime Minister Modi on November 16, 2016, in Goa said new currency notes were being printed since the last six months. On November 10, 2016, Arun Jaitley too said the new currency notes were already printed. When both of them claim that the new currency notes were already printed, then why did Prime Minister Modi do all this drama on November 8, 2016? He also said he had called a Cabinet meeting at 7 pm before he went on to address the nation. So, I am just asking, give some proof that Modi called a Cabinet meeting on demonetisation. Since they are not giving the records, I feel everything was done behind the curtain. The country must be run according to the Constitution of India. Without a Cabinet meeting and a Cabinet decision, they cannot move a single inch. The Constitution of India will exist whoever is the prime minister. I am a victim of demonetisation. I was to go to Chandigarh on November 22 and I suffered because I had no money. I suffered at that time because my granddaughter was to get married and there was no money in the banks because of demonetisation. It was with great difficulty that I arranged the money. Two hundred people died because of demonetisation. I want the prime minister of India to be punished because he put our country in difficulties as he took this decision without Cabinet approval. When he had already ordered the printing of new currency notes on May 19, 2016, why did he tell lies to the country (that the decision was taken on November 8, 2016)? And he is not even apologising for his mistake. Who told you that the new currency notes were printed on May 19, 2016? The Reserve Bank of India gave me in writing that they gave the recommendation to print new currency notes of Rs 2,000 on May 19, 2016. I have shown this letter to the chief information commissioner (R K Mathur) too. As per section 24 of the RBI Act, 1934, there is a provision which states that Rs 2, Rs 5, Rs 10, Rs 20, Rs 50, Rs 100, Rs 500, Rs 1,000, Rs 5,000 and Rs 10,000 currency notes can be printed. Nowhere is it mentioned that the government can print Rs 2,000 denomination notes. 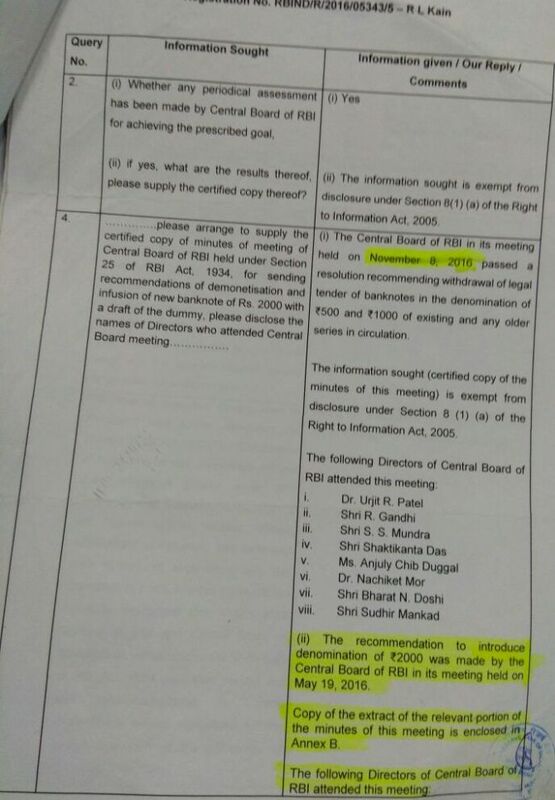 Chief Information Commissioner Mathur too asked the same question to the government where is the decision (copy order) of the government that they ordered to print Rs 2,000 currency notes. The government did not give him the decision (copy of the order), so that means the Rs 2,000 currency note is illegal. Now, I want to prosecute the prime minister of India. 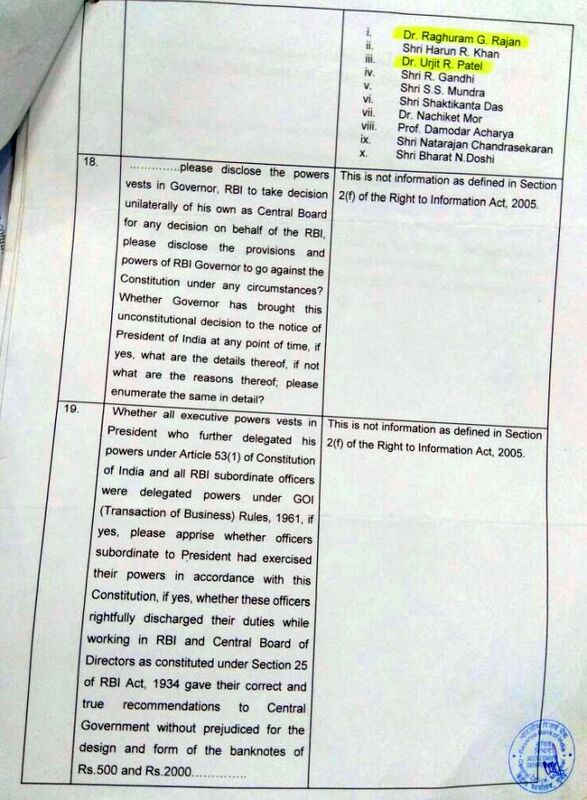 If I cannot, then wind off the RTI Act. But Section 24 of the RBI Act empowers the government to introduce any denomination of currency, apart from the ones mentioned in it, and also to withdraw any denomination from circulation. Yes, it does, but there is a due process to be followed, there has to be legislation introduced, or ordinance brought in, which was not done in this case. So how exactly was the decision taken and implemented? That's why I want to know. Why don't you believe the government's version that the decision on demonetisation will have to be kept secret as it can harm our economy? All Modis are running away from India, be it Lalit Modi or Nirav Modi, and I pay taxes for them. Now this ICICI scam is also coming out and we are all paying taxes. I am a retired officer and on my pension too I am paying taxes. I have to file tax returns too and I am feeling the pinch. You are now talking like an Opposition leader. I am not from any Opposition party. I am from the aggrieved party. I have no association with any political party. Why are you asking for details of Cabinet meetings regarding demonetisation? Indira Gandhi imposed the Emergency without Cabinet approval. She called a meeting of the Cabinet early morning (June 26, 1975) at 6 am and got approval for the Emergency, and now look what the status of the Congress party is today. She at least took a nod from the Cabinet for the Emergency, but here Prime Minister Modi did not take an approval from the Cabinet before imposing demonetisation on the country. If everyone is keeping quiet, then who will speak for the common man? Are you saying the Union Cabinet did not know about demonetisation? Yes. Modi took this decision in collusion with Finance Minister Arun Jaitley and five others. I also requested Prime Minister Modi's 'unedited' speech on November 8, 2016 to be given to me. His speech was recorded and cut to 42 minutes. (Please click HERE to see the reply from Prasar Bharati, which operates Doordarshan). The original speech was for 90 minutes and they are not giving a copy of it to me. The person who leaked this news (external link) was sacked from his job. Doordarshan told me in an RTI reply that they got the signal from the prime minister's office that this should be telecast live at 8 pm. It means his demonetisation speech was recorded earlier, in advance. SPG (Special Protection Group) officers went to Mandi House and took Doordasharn staffers to the PMO stating they had some recording work to be done. They took their mobiles with them and recorded the prime minister's speech in the morning. They did not allow these people to go home till 3 pm that day. All these things are coming out now. When he says he called the Cabinet meeting, then I am only saying, let him give the meeting's agenda. The reply which I got is that calling the meeting on demonetisation was confidential and it was not called officially. All said and done, demonetisation was initiated to fight the black money menace. But has the circulation of black money stopped? Has the Indian economy improved? Nothing has changed due to demonetisation. Moreover, the RBI is unable to give the correct figure as to how much money has come back in the system as they are still counting the money. They are not giving exact figures. Ask them for details and they have no data. If the government does not have the data, then who will have it? 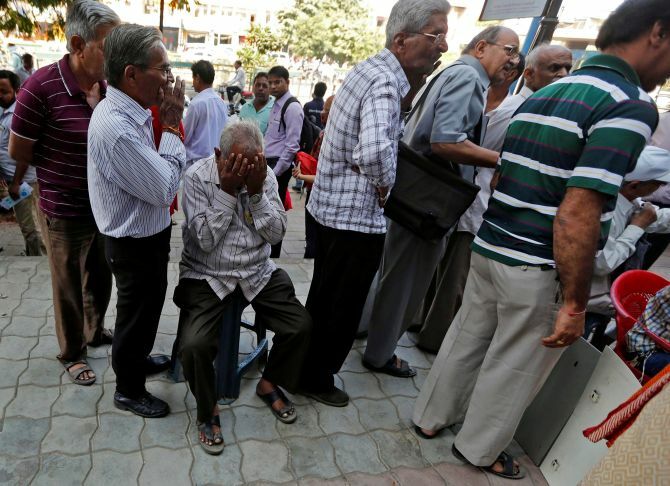 But the RBI said 99 percent of old currency notes have come back to the system. They are not giving exact figures to the Parliamentary standing committee. He (RBI Governor Dr Urjit Patel) has been called again before the committee. I bet you they don't know how much money has come back after demonetisation. After one-and-a-half years, does all this have any significance? Demonetisation was a dirty game played on the common man. It may take long to get justice, but justice must be done. I bow before the prime minister of India as a citizen of this country, but if he does something wrong, then I must oppose him. Dr Babasaheb Ambedkar has taught us this and our Constitution says so. Who will be proved right? NaMo or Manmohan? Has RBI really stopped printing Rs 2,000 notes?